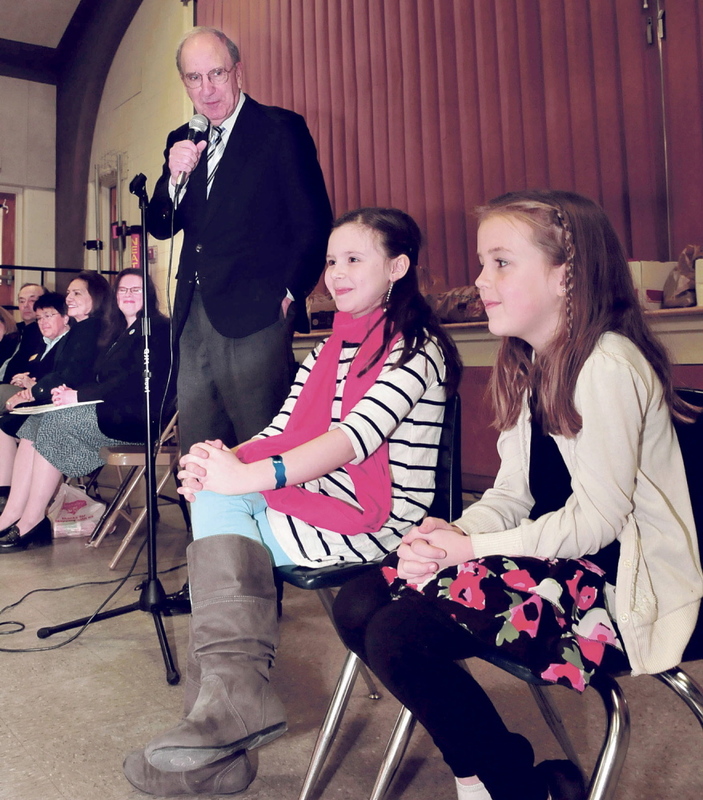 Alice Willette and Gabbie St. Peter were honored for their fundraising efforts Wednesday with a school assembly attended by former U.S. Sen. George Mitchell. WATERVILLE — Alice Willette and Gabbie St. Peter seem like typical second-graders: silly, joyful and full of energy. Yet officials said Wednesday the two 8-year-old girls from George J. Mitchell Elementary School showed impressive selflessness and maturity over the past month by raising thousands of dollars and hundreds of food items for their school’s food pantry in lieu of birthday gifts. Born one day apart in the middle of February, Alice and Gabbie had the idea that instead of birthday presents, they’d have a party and have friends bring food for the school’s food pantry. The pantry opened this fall to serve food for students, 68 percent of whom accept free or reduced-price lunch. Leading up to their party, the girls received a list of items the pantry needed and ended up filling dozens of boxes and grocery bags with hundreds of food items, in addition to $6,000. 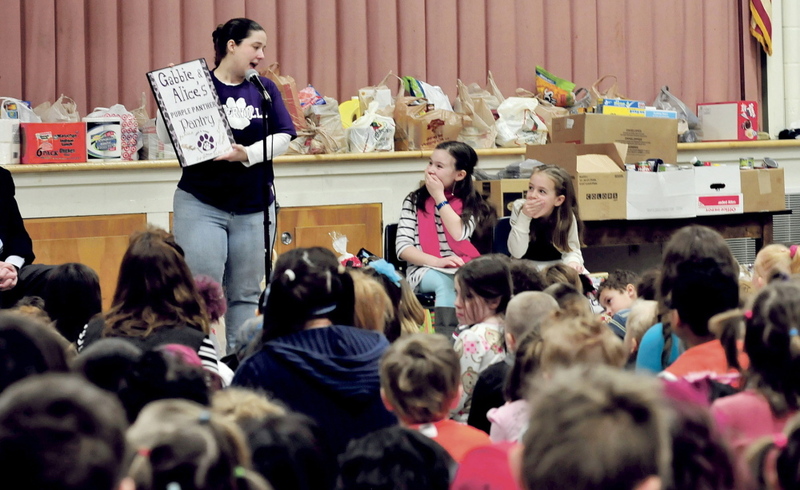 On Wednesday at the elementary school, a surprise assembly was held to honor Alice and Gabbie, with the entire school and many state leaders in attendance to show their support, including former U.S. Sen. George Mitchell, for whom the school is named. Sen. Colleen Lachowicz; Bill Alfond, a trustee of the philanthropic Harold Alfond Foundation; Waterville Mayor Karen Heck; and representatives for U.S. Reps. Chellie Pingree and Mike Michaud also were in attendance to show their support. Altogether, with the help from several surprise donations from Mitchell, his sister Barbara, Alfond, Heck and Taconnet Federal Credit Union, the girls raised more than $17,000 for the food pantry. “I was 100 percent surprised,” Gabbie said, while Alice admitted that she was “speechless”; and according to her, that doesn’t happen often. “I thought we were just going to get a thank-you,” Gabbie said. Students and teachers from kindergarten through third grade filed into the cafeteria, while Gabbie and Alice came in last to see the surprise of each of their families and entire school. School Principal Alan Martin addressed the audience and congratulated the girls for their benevolent deed. Pam Trinward, who was representing Pingree’s office, surprised Gabbie and Alice by telling them that Pingree addressed the U.S. House of Representatives Tuesday night to share the girls’ story. Pingree is married to S. Donald Sussman, majority owner of Maine Today Media, which publishes the Morning Sentinel. The surprise the two girls seemed to enjoy the most, however, was when Jennifer Johnson, president of George J. Mitchell School Parent Teacher Organization, which started the food pantry this year, announced that the school’s pantry would be named after them. While the pantry is still in its first year, Johnson isn’t exactly sure how much it will cost to stock it for its students. She figured it should cost between $4,000 and $5,000 per year. What the girls raised will help supplement the pantry for years, according to Johnson. Johnson, who helped the girls achieve their goal, also asked the state’s leaders if they would send along a word or two of gratitude for the girls unselfishness. She didn’t expect many of them to rearrange schedules and donate their time and money. Gov. Paul LePage was invited to the assembly but couldn’t make it because of a scheduling conflict, according to spokeswoman Adrienne Bennett. He has invited both Alice and Gabbie to the State House in May to visit. The two girls, surprised and slightly overwhelmed by the special assembly in their honor, sat in front of their peers with ear-to-ear smiles. For the past three years, both Alice and Gabbie have done similar fundraising events in lieu of their birthday gifts, with Alice collecting school supplies last year and money for the homeless shelter the year before; while Gabbie has helped gather food for the Waterville Humane Society. Just minutes after they were lauded for their latest act, the girls announced that for next year’s birthday, they plan to raise money for breast cancer awareness and research. After the assembly had ended, Johnson gave both of them a pink cape. The girls’ eyes lit up as they threw on the fabric and raced around the now near-empty cafeteria, arms outstretched, giggling and laughing. “I’m a superhero!” Gabbie yelled.